We recently shared about the dangers of 5G in a recent post. And there is far more on the subject. 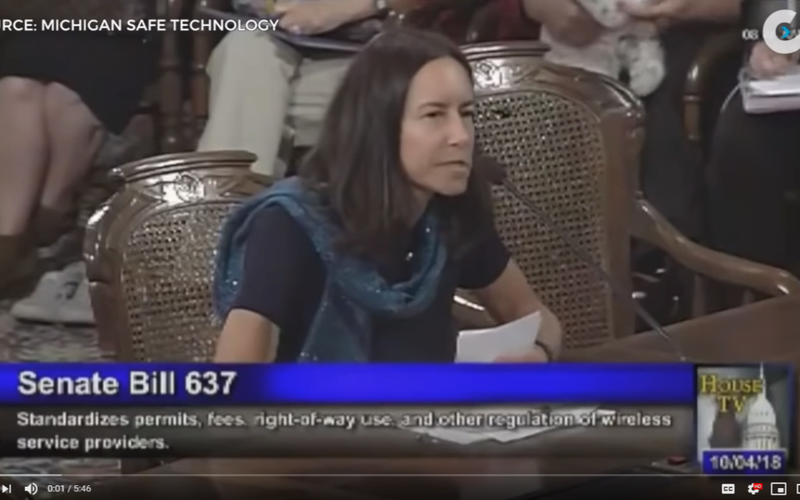 This shorter video has Dr. Sharon Goldberg testifying before the senate for Senate Bill 637 a couple months ago. There are some fascinating points you may have not heard before such as EMF’s connection to diabetes and mental health. I’m Sharon Goldberg, I’m an internal medicine physician. I’ve practiced medicine for 21 years and my background is mostly academic, internal medicine, hospital based, clinical research and medical education. So 5G is not a conversation about whether or not these biological effects exist. They clearly do. 5G is a conversation about unsustainable healthcare expenditures. Why do I say this? We’d been sitting on the evidence for EMR and chronic disease for decades and now we’re seeing all these epidemics appearing. So diabetes is the first epidemic. I think most of you know the statistics. They’re very scary. One in three American children will become diabetic in their lifetime, and if they’re Hispanic females, the number is one in two. Okay, so what does this have to do with wireless radiation. Wireless radiation, and other electromagnetic fields, such as magnetic fields and dirty electricity, have been clearly associated with elevated blood sugar and diabetes. That is what the Peer Review Literature says. It is not opinion. The closer you live to a cell tower, the higher your blood glucose that is based on hemoglobin a1c measurements. So the idea with small cells of putting the cells closer to people’s homes and bedrooms scientifically is very dangerous. And from an economic perspective, it’s dangerous. And you may not know this, I was shocked to find this out, but the way you create a diabetic…model of diabetes in rats in the lab is by exposing them to 2.4 gigahertz. And this is not for long term exposure. So ,I don’t have time to talk about the costs, but the huge problem with diabetes really is chronic kidney disease. End stage renal disease, the worst complication of diabetes, leads to hemodialysis. Hemodialysis is an automatic qualification for Medicare and if you don’t qualify for Medicare, we still have to dialyze the patient and the state ends up paying in many different instances. So renal failure is one percent of Medicare, but it takes up seven percent of all medicare expenditures. I don’t have time to talk about this anymore, but once again we have…so the other epidemics that clearly linked from the science with electromagnetic radiation are related to mental health. And this is, this is straight from PubMed. This isn’t my opinion. This is science, okay? Questioner: For those of us who aren’t physicians. What is PubMed? I’m sorry. It’s just the, the National Library of medicine. This is where you would go. This is just the peer reviewed literature. So we have three epidemics that clearly that they’re essentially one epidemic. We have deterioration of mental health in the United States. And if you look really at the science, what does it show? And these epidemics are our suicide epidemic, epidemics in violent crime, so shootings and the opioid epidemic. And I don’t have five minutes is not the time to talk about this. This is in the peer reviewed literature. I have a file to submit for the record, but these are facts. These are, and these are things that have just been glossed over by the wireless industry and I really don’t have time to talk about them in five minutes. I wish I did, but we need to examine our epidemics in the context of our EMF exposures. What does that mean? That means that the CDC tracking these epidemics, needs to. We need to start measuring how much radiation are people being exposed to and before we roll out 5G and this means there are four kinds of electromagnetic fields that we know are harmful to human health. So radio frequency, radiation, magnetic fields, dirty electricity and electric fields. Our exposure, any given person, and all humans are affected by EMF, our given exposure, has nothing to do with the research that my colleagues are going to site with the National Toxicology Program. That is an assessment of the risk of one cell phone in the near field. Okay. What is our exposure in in a day? It’s not one cell phone, it’s cell phones. It’s multiple wireless networks, it’s smart meters, it’s cell towers, it’s the sandwich and it all adds up and this is a serious problem for occupational health, public safety and personal safety, and I feel that it’s irresponsible to be even talking about the Internet of things and rolling out a new untested technology when we’re not even measuring what are our current exposures from the current networks. Will this information and intelligent people like Sharon Goldberg testifying be enough to stop the 5G rollout? Unfortunately, I doubt it. And even if so we’re still awash in 4G, WiFi, cell phones, cell towers and more. That’s where Blushield comes in. Blushield products are the only ones that actively create a coherent field your body’s cells can attune to that may mitigate the effects of all kinds of EMF radiation. Get started with purchasing Blushield today. Also check out many testimonials from happy customers, many of whom had their lives and health changed after plugging in a unit.